Sheena Miller has spent her lifetime in the outdoors pursing athletics and adventures. Growing up in the Okanagan, Sheena spent many years volunteering around athletic events such as Ironman and knew one day she’d love to do make her way around the course and try some announcing too! During the last 10 years Sheena attended university of Alberta to become a teacher of Physical education, outdoor education and English. While at university, Sheena got involved in physiology research projects, physical testing of firefighters, and high performance athletes. In a year exchange in Finland, Sheena taught physical education, and lectured at the University of Jyvaskyla. During this time she also pursued her love of the outdoors to work as a wild land firefighter in both Alberta and British Columbia provinces which lead to a current position working in Fire Management for the National Parks Service. Along the way Sheena has found time to run up Africa’s Mt. Kilimanjaro in three days, hike/run the West Coast trail and Juan de Fuca self- supported in the Winter season, trekked across Europe, Russia, China & Mexico, and survived paddling expeditions on many technical rivers. 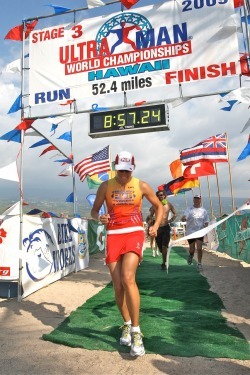 Most recently, Sheena has dabbled into triathlons completing the Ironman Canada twice, winning Ultraman Canada as well as completing Ultraman World Championship in Hawaii where she was the youngest finisher of the 2009 event. Whether she’s engaging in racing, thriving in a mountain environment, XC skiing or touring, solo white-water paddling, climbing or taking time out for meditation and yoga, Sheena advocates for the life-long sports, HUMAN POWER TRAVEL, health and wellness as well the importance of living a well-balanced low impact lifestyle. Sheena plans to finish a certificate in holistic sports nutrition and pursue youth triathlon coaching as well as move into high school teaching. In 2011, Sheena will attempt to row self-supported from Vancouver to Skagway Alaska. Other near-future goals include building her own small well designed log home, bike touring across Japan, climbing Mt. McKinley, solo paddling the Nahanni and Colorado River and at some point, completing the Race Across America (RAAM). In whatever challenge Sheena accepts, she will meet it head on with determination and positive energy - doing it now rather than later and getting out there to make it happen. Sheena’s rich and varied life experience and motivating attitude inspire everyone around her, making her a great ambassador to her community and the BEST team. Sheena can also work directly with you on event consulting, race committee management, social media and advertising.